2L120 FHP V-Belt. 1/4” W x 12" Overall Length. High Performance Bando Duraflex GL Polyurethane 2L-120 FHP V-belt. GATES 8400-0120 V Belts, Truflex 0120. Possible to replace rock tumbler "round" belts. 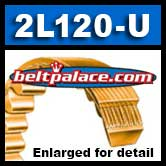 Gates 2L120 FHP V-Belt (Truflex 0120). 1/4” W x 12" Overall Length.